The High Street, or Bow Street as it was formerly known, commences at the junction with Granby Road and continues as Stonebridge Road (formerly Fishermans Hill) to the parish boundary at Botany Bay, where it continues on as Galley Hill, Swanscombe. Bow Street must have been quite a rural road in the 18th century, with cherry orchards, farmland, meadows, detached rusticated dwellings and rural cottages scatted irregularly on both sides. The coming of the cement industry led to masses of workers' terraced housing (which can still be seen in Factory Road) and the necessary retail shops that totally changed this rural scene in the latter three decades of the 19th century. 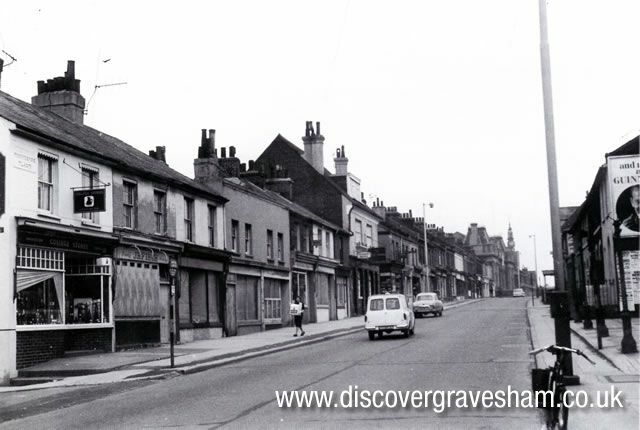 Leaving The Hill, Northfleet High Street starts almost opposite Granby Road where once stood the entrance gates to the Manor House, the drive to the house coming onto the High Street by the side of what is now Granby Place. Before the 19th century the high road did not follow the same course as at present. When approaching The Hill from the High Street it continued straight to the top of Granby Road, passing to the north of a farm, associated with the Manor House, including the Parson's barn. It then turned sharp right towards The Hill through a narrow passage between some cottages and passing over the village green to join the Dover Road at the Leather Bottel. In 1800, the Turnpike Trustees had two cottages demolished to improve the road and in 1828 the remaining two old cottages (that stood in front of the present Granby Place), were pulled down and the road was altered to its present course. 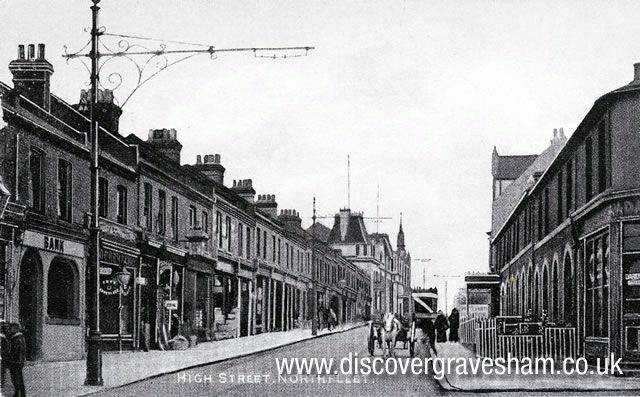 The Borough of Gravesend Electricity Works supplied the first electricity for street lighting of the main road in Northfleet in 1908; previously it had been lit by gas and oil lamps. All of the street gas lamps in Northfleet were not finally replaced by electric lamps until after the Second World War. On the north side of the High Street, on the cliff edge close to Granby Road, was 'Tel's'cafe (previously 'Pete's'), first established in the late 1930s but destroyed by fire in 2003 and now demolished. During the war a signalling system was set up between the cafe and the underground air raid shelter at the bottom of the pit. Before the chalk was excavated from the site of the Northfleet cement works the fields sloped down to the riverside. Lawn House or Northfleet Lodge stood on the eastern side of Lawn Road at the junction with the High Street. Francis (Paddy) Wadman commenced the construction of the house but it was still not completed at his death in 1814. The Whitehead family lived there for many years and it was later used for Mechanics Institute meetings, social events and political meetings. It was used by the local authority from 1876 for their monthly meetings until they built their own offices in 1884. It was demolished in 1900 and, in 1912, Mr. Hextable of Herne Bay made an application to Northfleet Urban District Council to erect a cinema on the site, but this was rejected. Returning to The Hill, on the south side, are nos. 1 and 2 High Street called Granby Place. This is a Grade 11 listed building, built in 1831, originally as two houses but later converted into a single residence. It was built soon after the main road was altered to its present course. In August 1848, the 'London Society for the Protection of Young Females' preferred bills of indictment at the Middlesex Sessions against George Joseph Murray (alias Bradley) and his wife Ann (who was the daughter of the notorious Mrs. H.). He lived in a splendid manner at Granby Place, keeping a livery carriage and servants and supposed by the inhabitants to be a gentleman of the highest respectability. On being issued with the 'preferred bills of indictment' he fled from Northfleet and the society offered a £10 reward for knowledge of his whereabouts. He was accused of keeping 60 houses for improper uses, in places ranging from Gravesend to Mayfair, Piccadilly, Holborn, Bishop's Gate and Southwark. Murray was accused of furnishing these houses, in a style according to their location, and installing a person in them who paid him £ 1 a day, which left them to derive their money from all receipts above that sum. Alfred Horlock, who built the steam locomotives, also lived at Granby Place at that time, but Granby Place is mostly remembered as bring a doctor's surgery for the past 150 years. Between Granby Place and the grounds of the Old Vicarage (now Vicarage Drive) is a car repair garage formerly belonging to the Horlock family. At the front there remains an old style petrol pump. Part of the wall between the garage and the old vicarage grounds is mediaeval and is the surviving wall of the farm that occupied the area around the garage and Granby Place in the 18th century. No records have been found relating to the vicarage before the 18th century, but at this time, as a result of the non residence of the incumbents, the building suffered from neglect. In 1834, it was so dilapidated that a new vicarage was built which the Rev. Southgate later enlarged. The vicarage was demolished in 1961 when the present residential estate was built in the grounds and 'Glanfield House' in the High Street became the vicarage until the new vicarage was built on the site of the old church school. To the west of St. Botolph's Church was at one time a cherry orchard in what was called 'Vineyard Field', a reminder that the Archbishop of Canterbury had a vineyard at Northfleet in the 14th century. This field was dug out for chalk in the 1860 to 1870s. The Northfleet Primary School (Lawn Road School) was the first Board School built in Northfleet. The first meeting of Northfleet School Board took place in December 1884 and within two months they had purchased a large area of land between Lawn Road and Factory Road, including the sites of the King's Head and Marquis of Granby, two inns that almost stood side by side. Both inns were demolished and a new Marquis of Granby was built on the Hill. Lawn Road School opened on 18 October 1886 and was extended in 1893 by the adding of new buildings, including the clock tower the first public timepiece in Northfleet. The clock tower was badly damaged in the 1987 storm and was subsequently demolished. On the west corner of Factory Road stands Portlands, formerly the Factory Club (later known as the Blue Circle Club) which was opened on 31 July 1878 and built at the expense of Thomas Bevan (architects Parr and Strong). It took three years to build at a cost of £ 11,000 and was built in honour of Bevan's eldest son, Robert's, coming of age. Before 1945, the club was open to all members of the public and was the cultural centre of Northfleet. Two halls, games room, sports facilities, a library and the headquarters of the Northfleet Choral Society plus numerous other local societies were all accommodated. Amongst various other features added over the years was a bowling green and an outdoor swimming pool that was opened in 1907. From here to the top of Stonebridge Hill was the main retailers' area of Northfleet from the 1880s until the 1950s. Northfleet High Street was a thriving area serving the large number of inhabitants who lived in the numerous workers' houses built on the adjoining streets. These were the days when convenience foods, refrigerators and cars were things of the future, and the community was dependent upon the High Street shops for their daily needs. Rayner's Court replaced the block of shops that were built in the High Street in 1883 between Portlands and Hive Lane. Built in the 1960s, it took its name from one well known family of retailers, an oil and paint shop, that had served the community for about 60 years. There were other well known retailers who prospered for years, such as Fred Waters, tailor, who also formed the 2nd Northfleet Scouts in 1907; Mr. Frederick Ware, sweet and tobacconist shop; and, Lincoln's the chemist, with the great pear shaped carboys in the window on the corner of Hive Lane. Hive Lane was originally the drive to a large house and grounds called Hive House. At the High Street stood two octagonal lodges either side of the drive entrance. The estate was eleven and a half acres, extending from the High Street almost down to the river and between College Road (then known as One Tree Lane) and Lawn Road. The house itself was a large three storeyed house with a basement, built of brick with stone quoins. It had ten bedrooms on the two upper floors, a large entrance hall, library, dining room, breakfast room and so on with butler's pantry and kitchen below, enclosed in its own walled gardens with carriage house and stables, the whole set in park lands and orchard. About the middle of the 18th century the house was the residence of Thomas Chiffinch, a barrister, and he was followed by Major (Paddy) Wadman who had married a niece of Mr. Chiffinch. Wadman died in 1814 and Mr. and Mrs. Kirwan leased the estate until c. 1830, when a Mr. Gibbons opened it as a boarding school. The estate was sold by auction in 1838 and purchased by Thomas Sturge, who in 1853 built the Knight Bevan and Sturge cement mill on part of the property. At the top of Hive Lane was the green tiled public house called The Little Wonder, named after the 1840 Derby winner. Between the Little Wonder and the Sturge school building were the shops built c. 1850 when Samaritan Grove and the terrace houses in Hive Lane were also built. In 1858, the population of Northfleet had reached 5700, and George Sturge, a Quaker, saw the demand for and financed a Non Conformist school, 'Sturge's British School' which was built on Thomas Sturge's property in Northfleet. The school was located on the north side of the High Street opposite the entrance to Wood Street. It was built mainly of flint with a slate roof. It consisted of one large room and a small office located just inside the main door. A small playground was located at the rear of the building enclosed by a low flint wall, and at the front was a small drinking fountain which had a small brass or copper cup attached to the wall by a steel chain. By the start of the Second World War the school had closed and, in February 1942, it was opened as a 'British Restaurant'. After the war, in 1945, it became the headquarters of the Ist Northfleet Scouts. Under the High Street were several disused railway tunnels that were utilised as air raid shelters during the Second World War. At first they had sand bags to form the blast walls at the entrances but later brick blast walls and electric lighting were provided. They were 80 feet below ground level and were virtually bomb and soundproof. Residents took their bedding there every night during the Blitz, being assured of a good night's sleep. People made their own entertainment during the evenings, including 'housey housey' (a form of bingo) and community singing, women had their knitting and children their toys. Returning back up the High Street, Bow House was built on the south side about two hundred years ago opposite the later site of the former Factory Hall. 'Paddy' Wadman built it, intending to open it as a bazaar, but due to its failure it became known locally as 'Paddy Wadman's Folly'. The building and grounds were leased to local farmers and eventually demolished prior to the site being put up for auction in 1842. Thomas Sturge purchased the land and it became part of the 'Northfleet House' estate. Lower down the High Street in about 1912, the 'Northfleet Cinema' was opened. It remained in use as a cinema until December 1929, when a more modern cinema was built next door. It then became known as 'The Astoria' and continued mainly used as a dance hall until it was pulled down in 1957, along with the cinema that had been built to replace it, and then known as 'The Wardona'. The 'Wardona' changed hands several times during its lifetime and had been previously known as the 'Stratheoner' and the 'Star'. Until the 1840s, about 50 yards south of the cinema site stood a windmill, about which very little is known. A few yards back from the High Street, in Rose Street, were Moody and Windiate's garages. Mr. W.J. Moody, motor job master, was noted for his 'charabanc' (motor coaches) business started in 1919. His father started the business in the 1880s, but in his day people were taken about in horse drawn cabs. Court Mews was formerly the Northfleet Police Station and was built in 1866. Until then the old Parish Lock up was in Springhead Road, behind the Leather Bottel. The Magistrates' Courtrooms that were at the rear of the police station were opened on 29 October 1887. Wood Street ran downhill from the High Street to Station Street and in 1875 Wood Street Primitive Chapel was opened, providing a place of worship and also at one time schooling for the young children. The building remains but is no longer used for worship. In 1871, the population of Northfleet had increased to 6500 and the Roman Catholic community, who established the St. Joseph's school on the south side of the High Street between Station Street and Rose Street, provided some of the school accommodation that was sadly lacking in the town. The building served as a church on Sundays and as a school during the week. The infants school was held in the basement of the premises, the main school on the upper floor. The licence for holding marriage ceremonies was transferred to the new church on The Hill in April 1916. However, the school continued in the building until April 1932 when St. Joseph's moved to a new site in Springhead Road. From the High Street, Station Road led down from the Ingress Tavern to Northfleet Railway Station. On the corner with Station Street were the Mission Rooms, built in 1882. They were used as a temporary boys school by the Northfleet Education Board in 1886 and 1887 while the new school was being built at Lawn Road. The Northfleet Silver Band practised in the Mission Hall for many years. Jack Jackson, the son of the band conductor, played the cornet as a boy in the band. He later became one of the BBC record presenters in the 1940s to 1970s and was the forerunner of the modern disc jockey. The railway station was opened in 1849 at its present location although there was not a great population in this area at the time, nor had the huge cement industry as yet developed. The original station building perished in a fire and was rebuilt in the late 19th century. Railway electrification took place in 1952. The underpass between the 'Up' and 'Down' platforms was utilised as the main access to Ebbsfleet Park, which was situated between the railway and the Ebbsfleet river that skirted the park's southern boundary. The park was opened on 12 May 1909 and in the early days children used to paddle and play in the clear water of the Ebbsfleet, but after the construction of the sewerage works the stream became dangerously polluted. The park had a bandstand, which was frequently used prior to the Second World War, swings, roundabouts and a slide for the children, plus a putting green for the adults. There was a brick park keeper's hut just inside the main gate, along with a drinking fountain. Ebbsfleet Park was closed in about 1971 when the new railway sidings for Northfleet Cement Works were built on the site. From the junction with College Road, the High Street becomes Stonebridge Road, commonly known as Stonebridge Hill (formerly Fisherman's Hill). At the foot of Stonebridge Hill was the 'stone bridge' over the river Ebbsfleet, built in 1634 to replace an earlier one of unknown age. The bridge was angled slightly to the north and not directly towards Stonebridge Hill. The reason may have been that the lower road round by the Creek and along to the India Arms was the established route, at that time, to Gravesend. It was on 1 June 1648 that this was the site of a Civil War skirmish, when a force of six hundred Royalists, under Major Childs, were defeated by four hundred Parliamentarians, mounted and foot soldiers, under Major Husband. A second brick bridge was aligned to Stonebridge Hill, built many years later alongside the old bridge. In 1775, the Trustees of the Turnpike Road issued instructions that a sheep wash was to be constructed in the space between the two bridges. This fell into disuse in the 19th century and became known as Plough Pond and at the end of the 19th century it was filled in and the Ebbsfleet diverted under the road through a pipeline. The field on the opposite side of the road from Gravesend and Northfleet Football Ground was known as Plough Marsh. In the north west corner was a lake with small islands that had resulted from clay digging at the turn of the 18th/I9th centuries and was described in the late 1840s as being part of the beautiful view from Huggens College. By 1870, it was known as the 'mud hole' and during the next two decades became the scene of many drownings. Eventually the council forced Mr. Bevan to fill it in during the 1890s. The travelling fairgrounds and circuses used the field that was known locally as the ‘Meadow’ when they set up in Northfleet and in the Second World War a barrage balloon was sited here during the time of the doodlebug raids. The area is now part of an industrial estate. The Ebbsfleet United Football Ground (formerly Gravesend and Northfleet Football Ground) stands at the bottom of Stonebridge Hill. Prior to the Second World War it had been the home of Northfleet United founded in 1890, but the team had played at other venues before moving to this site in 1905. In 1946, the Gravesend and Northfleet Football Club was formed and they continued to play on the Stonebridge Road ground until it became Ebbsfleet United in 2007. On the parish boundary between Swanscombe and Northfleet was the Britannia Cement Works, or Macevoy and Holt's works, built in the 1870s and located at the bottom of Galley Hill at Botany Bay. They became a member of the original Associated Portland Cement Manufacturers group of companies in 1900. The Northfleet Paper Mill, most of which lay in Swanscombe, was erected between 1884 and 1886 for Carl David Ekman (1845 1906). Ekman was a Swedish chemist who invented a process of pulp making by cooking wood by the sulphite process. However, economic problems coupled with a lawsuit against Ekman over the disposing of some sulphite waste into a nearby quarry, causing the formation of sulphurous acid, ended his business. The New Northfleet Paper Mills Limited took over Ekman's business in 1903. In 1923, the company became a part of the Inveresk Group. The buildings were cleared in the 1970s and the site was developed into the present day industrial estate. The Manor Way runs from the bottom of Galley Hill through to the bottom of Craylands Lane, Swanscombe. On the north side are the Botany Marshes and the Broadness Peninsula and on the south side the rising ground was excavated for chalk, forming the pit where the New Northfleet Paper Mill had stood. This ancient right of way also formed the boundary between Northfleet and Swanscombe. According to the 1907 Directory, R.D. Pembleton at Deep Water Wharf was a millstone maker (he was at one time a local councillor). When the site of the New Northfleet Paper Mill was being developed a number of millstones were dug up and one was set up at the entrance to the estate. Pembleton may have produced millstones for cement grinding as well as for windmills. They were used for grinding the cement clinker prior to the introduction of rotary steel drums with steel balls, now used for this purpose. There was a scheme by the government during the Napoleonic War, in 1805, to build a naval dockyard on Botany Marshes to replace the Royal Dockyards at Deptford and those at Sheerness and possibly Chatham. The peace in 1815 put an end to these schemes and no work was done; the land was purchased but subsequently disposed of.